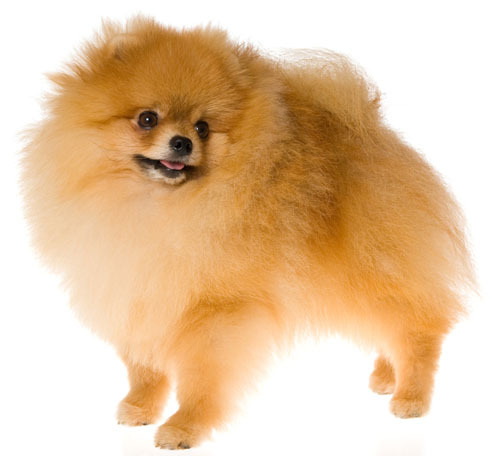 Learn about the temperament and personality of the Pomeranian. Discover what he's like to live with, his traits and characteristics and how he generally behaves. And look at lots of Pomeranian photos. The Pomeranian is a cocky, extraverted, devoted and affectionate little guy. They are intelligent, easy to train, and they love to please their owners. They like to keep their bright little brains busy and thrive on learning new tricks and commands. For this reason, they excel at obedience competition. They will seem to understand your every word. Add this trainability to their cuddle-ability and you will see why this is a popular choice for therapy dogs. They are excellent at comforting the elderly or ill. They just love to snuggle up and nap in a person's lap. They don't require much exercise, but will require lots of your attention. They will want to be included in whatever you are doing, and have been known to be a bit nosey. They make a natural watchdog and will bark a warning when anyone approaches your home. They are distrustful of strangers. However, they are also known to bark recreationally. They will do well with other dogs, but be aware that the Pom doesn't know that he is tiny, and will be fearless with a dog of any size, which can get him into trouble. You will have to supervise your Pom when he is interacting with other dogs. You will also need to supervise young children to ensure they are respectful and gentle with their Poms. Poms can resemble the cutest stuffed animal in the world, and small children can unwittingly trample them. A Pomeranian will make you an excellent, loving companion and will entertain you each and every day. The Pomeranian is very intelligent and easy to train. He learns new commands very fast. The Pomeranian is a very heavy shedder. He sheds an awful lot of hair! You'll find hair all over your home, stuck to everything! You'll probably even find it in the butter!